Map maker : DÉPOT DE LA MARINE. Size : 24.4 x 36.0 inches. / 62.0 x 91.4 cm. 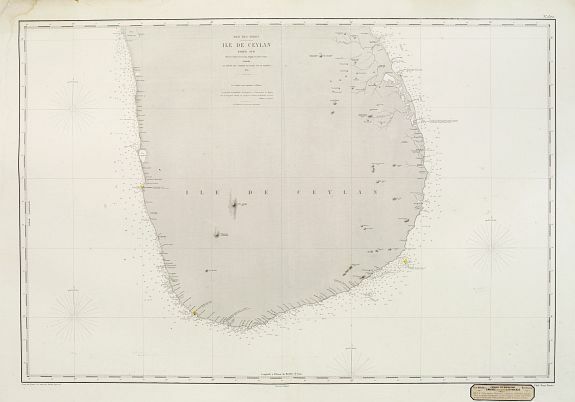 Description :Two very large charts representing the northern and southern part of Sri Lanka and giving details about the Indian seacoast around the Gulf of Mannar and the Palk Strait. Showing villages, banks, isles and soundings made in metres. With a few places highligthed in red and yellow. Engraved by Grenier. With re-seller sticker in the lower right corner indicating that the map was on sale at the bookshop Librairie des Navigateurs of C. Massée successor of J.J. Fourcade, Place Richelieu, 1, Bordeaux. 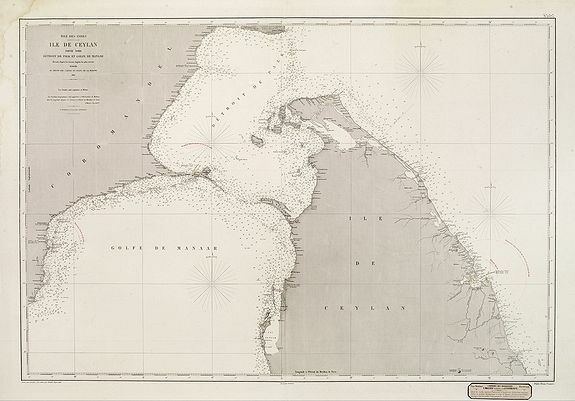 Condition : Marginal water stain along upper part left border. Repair of a couple of marginal tears. Good margins. Good condition.